I bought prints of 'Best Friends' for gifts for my parents and for my best friend. 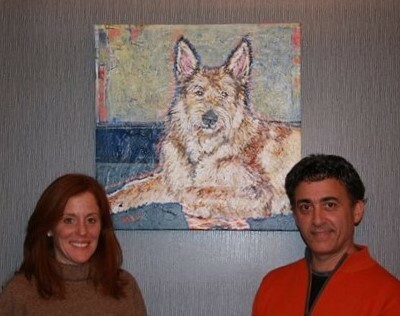 It's a symbolic gift as my dog is featured in the painting. The process of ordering was very easy, all I had to do was tell Dede what I wanted and she took care of the rest, including hand delivery. I have known Dede for years and have always been intrigued by her work--amazing artist and person. 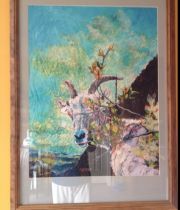 My sister Valerie Busse gave me a print of "F Ewe" for my birthday!!!! Beautiful high quality print. She is hanging in my kitchen and makes me very happy!!!! Love your work Dede Farrar. 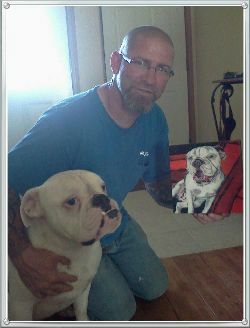 Rick Ferguson of Rapid City, South Dakota poses with his birthday present, a portrait of Frank the Bulldog in the 8" x 8" size presented to him by his wife. And look at the real Frank! Art makes such a great gift. Rick was very happy husband. Once again, we'd like to thank you for the magnificent painting of Ozzy. It has received many compliments from everyone who's entered our home. Without ever meeting him in person, you captured him perfectly. From our first contact with you, to completion of the work, everything was seamless and quite professional. Thank you again for immortalizing Ozzy. You are highly recommended!